A brief look at some of the turning points in the history of the Poole Harbour area. Once you move inland from the Studland Ferry the land rises to the chalk ridge that runs from Studland to Lulworth forming the backbone of the Isle of Purbeck. The beach at Studland gives way to magnificent cliffs, the start of the so-called Jurassic Coast which stretches across South Dorset and on to the mouth of the River Exe in Devon and spans the entire dinosaur period of history, the Triassic, Jurassic and Cretaceous eras. Fosssils from these times were mostly laid down on the ancient seabed and many can be seen in the local Dorset County Museum. Many of the cliffs have a characteristic slant to them and this, and the presence of fossils, are due to slow but spectacular upheavals in the rocks of the area as they were lifted into their current positions. Walking westwards is truly walking back in time, as the oldest deposits are found at the Devon end of the coastline and the youngest here at the Purbeck end, a mere 140 million years old. Changes in sea levels have altered the shape of the harbour over the years. In Tudor times, Poole was almost an island. Purbeck and the Isle of Wight were once joined and Old Harry and the Needles can be seen to have much in common. The Rivers Frome and Piddle join at Wareham and drain much of Dorset. Originally, these joined the Stour and the Avon at Christchurch with all three joining the Hamble to break out into the Channel at Spithead, east of the Isle of Wight. Since the end of the last Ice Age, sea levels have risen dramatically. The sea eventually broke through the chalk ridge, flooding the river valleys and dividing off the Isle of Wight. Since that time, the shape of the Harbour has changed continuously under the influence of rising sea levels. As recently as 250 BC, with the sea level lower than it is today, Green Island was much nearer to the mainland via Cleavel Point, now beneath the sea of Newton Bay. This crossing was important enough to the local communities for them to have built jetties at Cleavell Point and on Green Island. A structure long thought to be a submerged causeway between Cleavel Point and Green Island has now been revealed as the two arns of a massive Iron Age harbour wall. Ball Clay, Shale, Ironstone (from which the Agglestone Rock and the Puckstone are formed) and Purbeck stone have been mined in the area since the Bronze Age. The area has been occupied since pre-historic times. A 2500 year old log boat, recovered from the entrance to the harbour, is on show at Poole Museum and towards the north of Wareham Forest are some iron age earthworks, Woolsbarrow Fort. Just off the B3351, nestled in a wood, is the Bronze Age Rempstone Stone Circle. On the ridge to the South is Nine Barrow Down and further barrows are found to the east. A stone avenue in a field to the west was destroyed in 1957, but perhaps this area held similar significance in ancient times to the larger, more famous sites such as Avebury. By 250 BC, there were jetties round the Harbour allowing pottery and jewellery made from polished Kimmeridge shale to be exported from the area. Jetties on Green Island and Cleavel Point (now underwater in Newton Bay) have been found and researched by archaeologists working in the area. The Romans used Poole Harbour as a supply route for the invasion of Dorset, the land of the Durotriges, shipping men and equipment along the coast from Chichester via a fort at Hamworthy. They found and mined Purbeck Stone. Traces of their roads exist in the surrounding area such as the remains of the road up to Badbury Rings, evident in Hamworthy and Broadstone. Salt works have been found all around the Harbour. Roman Black Burnished Ware pottery, found all over Britain, and often crucial in dating Roman sites, was apparently all made on the shores of Poole Harbour. Vikings came up the river to Wareham and settled there briefly until King Alfred defeated them near Arne and drove them out to sea where bad weather destroyed over 100 ships. After invading and sacking the Monastery at Cerne, Canute sailed to Brownsea Island. His spoils from the Abbey at Cerne were said to have been returned later when he became the English King. In the 1500s, Harry Paye so infuriated the French and Spanish by looting their coastline and shipping that they sent a fleet that sacked Poole, killing his brother and setting fire to the town. Harry's name lives on in our name for the Old Harry Rocks. In the time of Henry VIII, a blockhouse was built on Brownsea to guard the entrance. The men of Poole had to muster to defend the entrance, and to find available men, a census dating from 1574 lists 296 Poole men required to attend to fight at the Castell of Brownz. This was much resented. The Castle today is quite modern, having suffered two major fires and much remodelling by successive wealthy owners. The Italian inventor Marconi spent 8 years living at the Haven Hotel and experimenting with wireless telegraphy between Sandbanks, Brownsea and the Isle of Wight and then to the Royal Yacht at Cowes. Enid Blyton spent much time in Purbeck inspired by the landscape, which she incorporated in her novels for children. Some think that Whispering Island was based on Brownsea and Kirrin Castle was based on Corfe Castle. The railways running across the heaths of the area also inspired her. You can look into this in more detail here. Wareham has many reminders of its Saxon past in its Saxon Walls, a well preserved set of defence earth works that still make a nearly complete circle around the older part of the town and in the town itself where its old Saxon layout can still be seen. On the Saxon Walls of Wareham, overlooking the River Piddle, you can still visit the Saxon Church, St Martin on the Walls. It was used as a refuge during a fire that hit Wareham in the eighteenth century. The church commemorates the exploits of Lawrence of Arabia, who settled near Wareham at Clouds Hill on returning to England. The Priory, said to have been founded by St Aldhelm in the 8th century, operated as a nunnery, although it was sacked and rebuilt several times before the 11th century. It was then taken over by monks until the dissolution. It was rebuilt in the 16th century, much altered over the years, and is now a luxury hotel with beautiful gardens. The village is dominated by the relatively recently ruined castle, blown up by order of Parliament after capture in 1646. This is the true defensive gateway of the Purbecks, being the only significant gap in the ridge. The cross in the square is Victorian, but the base is said to date back to at least a royal decree of 1381. William the Conqueror granted land to Longspee and Winchelsea as a reward for their support in the 1066 conquest. Later, because Ower had become such a busy and important place, Edward the first issued a charter authorising the building of a new town. Plans were drawn up, but sadly the Black Death brought it all to a halt. There remain a few cottages at Newton today, south east of the Ower peninsula. Newton Church remained on maps for a long time: an enthusiastic map maker working at the time the town was being planned included the church not realising that it would never be built! The old part of Poole, close to the Quay, has many pre-Georgian buildings, some of them dating back over a thousand years, see Poole history. Although it was small, Poole was nevertheless a very important link in the trade with Newfoundland from the beginning of the sixteenth century. The Mansion House, Poole House, West End House, Sir Peter Thompson House, Beech Hurst and Upton Country House were all built by Poole merchants of the Newfoundland trade. The end of the Napoleonic wars brought this time of plenty to a close. There was an isolation hospital at Baiter at one time. Poole has now become more important in the area. The output from Poole Pottery, which developed from Carter's Tiles, a business started in Victorian times, and which produced the tiles that lined the London Underground tunnels, became world famous. Gradually, over the last century, although it retains its share of light industry, Poole has become more and more associated with the tourist trade. The town has grown rapidly. The coming of the railway, initially Castleman's Corkscrew via Wimborne, changed the landscape, enclosing and creating Poole Park, crossing the Holes Bay and the mouth of Lytchett Bay. Poole is now the largest town in the area but quays on the other side of the harbour made that area far busier than it is today. The famous Purbeck stone, a soft stone often used for tombstones, has been quarried for many years even in Roman times. Less well-known is the ball clay, extracted for 2000 years in the area and used for making pottery by the Romans and, for the last few hundred years, sold on for making porcelain and many other important materials. You can find out about these many uses both in the past and up to the present day at this web site about ball clay. Ball clay was exported to Stoke by sea and regarded as "the best clay in the world" by Josiah Wedgwood. In the days before trains and lorries, transporting stone and ball clay was a huge undertaking, requiring quays and jetties as near to the quarries as possible. To aid the transport of these materials, quays and jetties for ferry crossings were built on the south side of the harbour, at Ower, Middlebere, Goathorn and Redstone Point. Passage houses were built next to the quays for passengers to await the next boat for their crossing and the old houses remain in some of these places today. But the materials still had to be moved from the quarries to the quays and when production in the area was at its height, tramways and plateways were laid to connect the pits and quarries to the jetties. You can still see the route of the Middlebere Plateway on Middlebere Heath and Pikes Tramway across Stoborough Heath and parts of them can now be walked on straight, level footpaths and bridleways. The current ferry service between Studland and Sandbanks started in 1926 and was then improved from time to time. Further west, the 1920s lift bridge between Poole and Hamworthy is the third in that location. Previously there was a toll-bridge and before that, a rowing ferry. In the late 20th century, oil was discovered and BP set up a site at Wytch farm. There are now wells at Wytch Farm, Ower and Goathorn representing the largest onshore oil field in Western Europe. The oil-rich seams are a continuous band, passing from Kimmeridge, through Wytch Farm, under much of Britain to the North Sea Oil fields. The remains of a Tudor ammunition dump are still visible along the shore on Baiter. The Purbeck area saw action during the Civil War mainly centred around Corfe Castle. Lady Bankes, with her husband away fighting with the royalists, defended the castle with a few men until she was betrayed and later Cromwell had an act of Parliament passed allowing him to dynamite the castle so that it could never cause trouble again. At the same time, Poole supported the Roundheads and successfully defended the town with the help of the town ditch and barricade which was near the Hungerford Bridge between the railway and the Old Town. Along with many others in Dorset, some Wareham residents supported the Monmouth Rebellion and were duly hanged from gallows on the Wareham Walls close to the current car park. More recently, Wareham was a garrison town in the First World War. The The Royal Navy Cordite Factory at Holton Heath, built in 1914 supplied ordnance to the Navy during both World Wars. Ordnance was taken from the blast houses by hand pushed rail carts and shipped from a jetty opposite Rockley Point. Studland Beach was used for exercises during the second World War, particularly during the run-up to D-Day. It was also heavily defended, including a flame defence system, where oil could be pumped into the sea and ignited, a system that was never in fact used. Decoy areas were set up to try to divert enemy bombers. One on Brownsea Island was successfully used to protect Poole. Locations in Wareham Forest and a location on Arne provided diversions for the Cordite Factory at Holton. Landing Craft were built at the Dorset Yacht Company and at Bolson's Yard. The Flying Boat Station at Hamworthy with its support network and marine runways made Poole a target for bombing. 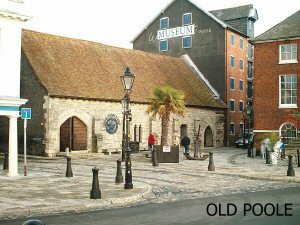 Smuggling long played a role in the area, with the most notorious raid being by the Hawkhurst gang, reclaiming tea and brandy impounded in the King's Cellars on Poole Quay, now Poole Museum. Before Bournemouth was developed, the Chines and the heathland behind them made excellent landing places for contraband. Originally Japanese, Sika deer have made a home for themselves around the Harbour. There are stories of their establishment in Wareham Forest after some of them escaped from Brownsea Island by swimming to Arne in the late 19th century and of another group from Hyde House Park thirty years later. You can read more here about the life of these secretive animals and their place in Dorset. If you have any further information about the history of this fascinating area it would be great if you would email us. Page updated 1st August 2016.